Scoliosis is a word we use to describe the most common type of spinal curvature. When a scoliosis develops the spine bends sideways and rotates along its vertical axis. These changes have cosmetic and physiological effects with long-term consequences which may result in significant health problems with severe curves. Idiopathic scoliosis is a condition not associated with any other disorder or disease and it comes in three main types classified according to age of onset; Infantile, Juvenile and adolescent idiopathic scoliosis. 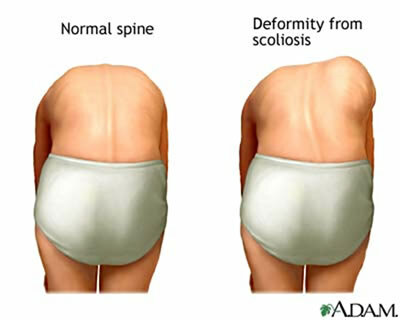 INFANTILE– This type of scoliosis is rare in Australia and the majority of these cases spontaneously resolve. This consist of a curvature that develops before the child reaches the age of 2. JUVENILE– A curve that develops in the age range of two to ten years. ADOLESCENT IDIOPATHIC SCOLIOSIS (AIS) – This type appears in early adolescence and is much more common in girls than boys. While the incidence of very small curves is similar in both sexes, females account for about 90 percent of curves seen in clinical practice. CONGENITAL– In this type a curve develops because of congenitally abnormal vertebrae. This form of curvature is often associated with congenital abnormalities in other body systems such as the heart and kidney. Detailed examination is required. NEUROMUSCULAR– A wide variety of diseases and disorders of the central nervous system (brain), nerves and muscles can, but not invariably, result in the development of scoliosis. Muscular dystrophy is one such condition in which scoliosis can occur. PARALYTIC– This is the term applied to the curvature which frequently develops when there is loss of spinal cord function early in life from disease or disorder, particularly injury (quadriplegia and paraplegia). ‘Environmental’ factors play a role in causation. The yet-to-be identified gene(s) have a very strong tendency to be passed down on the female side. However, there are no hard and fast rules for the pattern of inheritance and a girl or a boy who develops AIS may be the first one to do so in several generations of a family. If an adolescent is found to have AIS then it is a wise precaution and good medicine that his/her siblings be examined for the condition, but not before the 11th year. The most likely affected first degree relative is a maternal female cousin. There are three common single patterns – thoracic, thoracolumbar and lumbar. The second of these has its apex at the junction between the thoracic and lumbar regions. Curves may point in either direction but the right thoracic and left lumbar curves are the most common patterns. A double curve pattern is also common with right thoracic and left lumbar components. The neck (cervical) region is not affected by AIS.